I was asked to install a KMS Server for Office 2010/2016, Windows Client (7/10) and Windows Server (2008/2012/2016). The intention was to replace all KMS servers that were build up in the last 10 years by a KMS server hosted on Windows Server 2016. 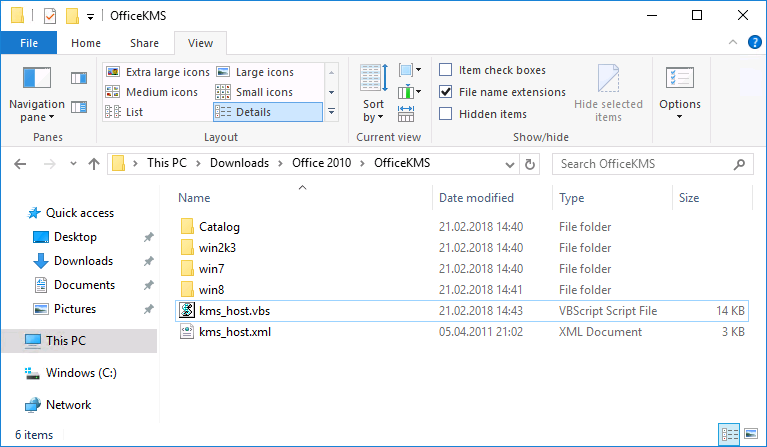 I’ve started to install the KMS Keys for clients and servers as I’ve already explained for Server 2012 R2 in “Windows 10 / Office 2016 – KMS Activation“. For Office 2016 I’ve just had to install “Microsoft Office 2016 Volume License Pack” and the activation was working fine. 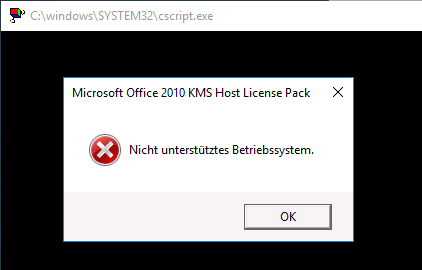 In the last step I’ve tried to install “Microsoft Office 2010 KMS Host License Pack” that is necessary for Office 2010 KMS activation but I haven’t recognized that this package isn’t available for Server 2016. Nevertheless I’ve downloaded the Package and tried to install it on Windows Server 2016. As exspected I’ve received a error message. Start the installation and wait for the error message. Do not close any installation window! 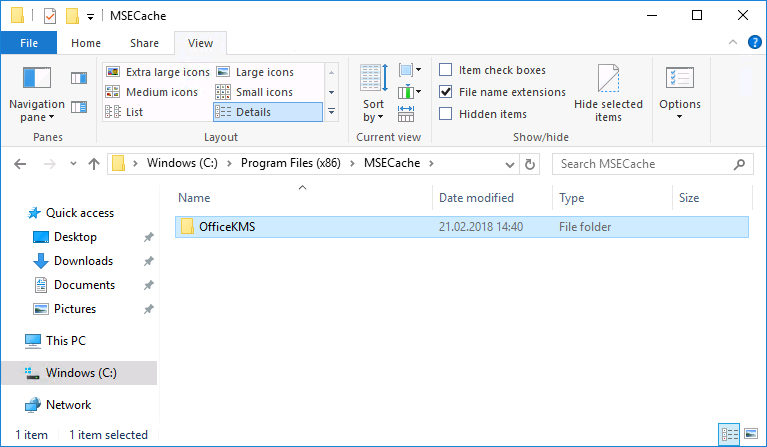 Open the File Explorer and Navigate to “C:\Program Files (x86)\MSECache\OfficeKMS“. Copy the folder to another place on your harddisk. If (Ver(0) = “6” And Ver(1) >= “2”) Or (Ver(0) >= “7”) Or (Ver(0) = “10”) Then. After performing these steps. The installation will run without any error messages. Ensure that the installation was successfull by running slmgr.vbs /dlv all. 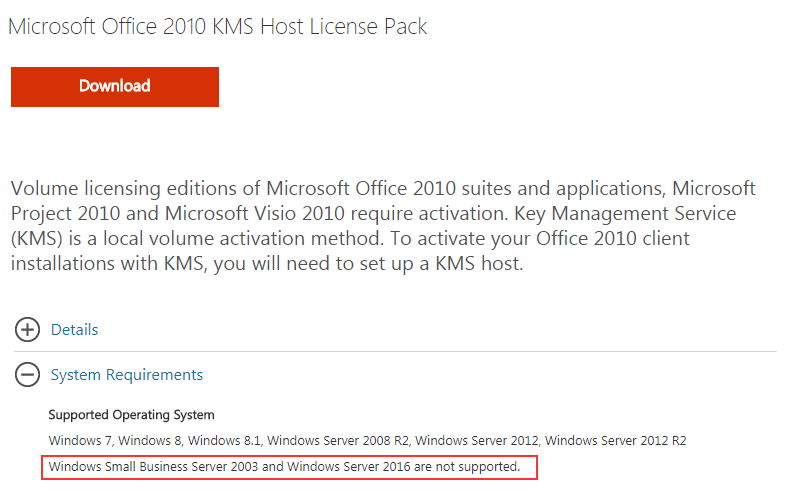 The KMS service sould now present you “Microsoft Office 2010, KMSHost edition“. After that you can easily activate your KMS keys as explained in the following chapter. The official way is to install a Microsoft Windows Server 2012! Type the following command to integrate your volume license key to the KMS server. C:\Windows\System32>cscript slmgr.vbs /ipk XXXX-XXXX-XXXX-XXXX-XXXXX Microsoft (R) Windows Script Host Version 5.8 Copyright (C) Microsoft Corporation. All rights reserved. Installed product key XXXX-XXXX-XXXX-XXXX-XXXXX successfully. Installed product key XXXX-XXXX-XXXX-XXXX-XXXXX successfully. If the key isn’t accepted by the server you will receive the error 0xC004F015. Display the installation ID that is necessary for telephone activation. You have to add “bfe7a195-4f8f-4f0b-a622-cf13c7d16864” to receive the Office 2010 “Installation ID” otherwise you will receive the “Installation ID” for Windows Server 2016 / Windows 10. 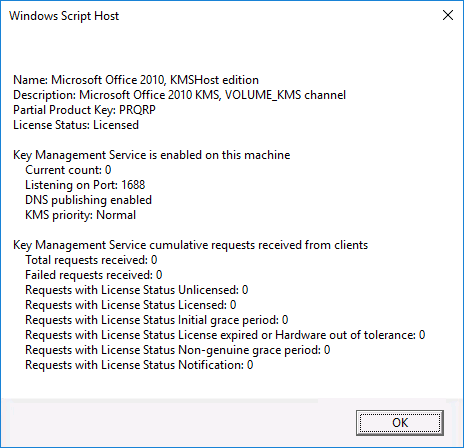 Activate your KMS key by calling Microsoft hotline for product actiavtion and enter your “Installation ID” by telephone. You will receive a “Confirmation ID” that must be entered by the following command. You have to add “bfe7a195-4f8f-4f0b-a622-cf13c7d16864” for Office 2010 activation otherwise you’ll try to activate Windows Server 2016 / Windows 10 with an Office “Confirmation ID”. C:\Windows\System32>cscript slmgr.vbs /atp 344813441331539443010980848521935031229423670225 bfe7a195-4f8f-4f0b-a622-cf13c7d16864 Microsoft (R) Windows Script Host Version 5.8 Copyright (C) Microsoft Corporation. All rights reserved. Confirmation ID for product bfe7a195-4f8f-4f0b-a622-cf13c7d16864 deposited successfully. Confirmation ID for product bfe7a195-4f8f-4f0b-a622-cf13c7d16864 deposited successfully. You are done with the Office 2010 key integration.